Crochet Amigurumi Chihuahua is the fifth project in the Amigurumi series done for Soft Dolls & Animals. 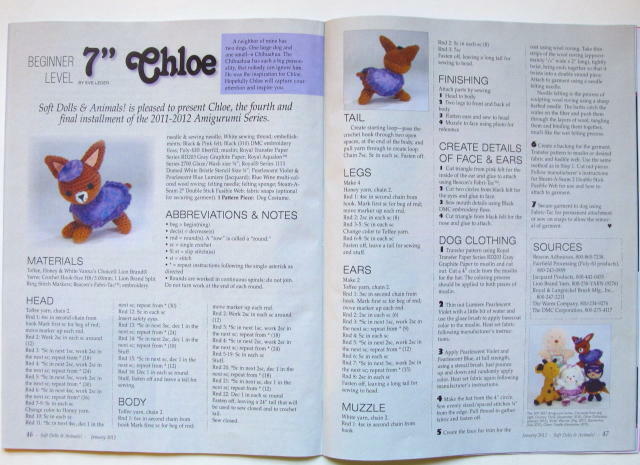 It appears in the January 2012 issue of Soft Dolls & Animals. The inspiration for this project came from a neighbor who has two dogs. One large dog and one small–a Chihuahua. The Chihuahua has such a big personality, that nobody can ignore him. He was the inspiration for Chloe. Hopefully Chloe will capture your attention and inspire you. Based on the positive feedback, any of the projects from the Amigurumi series would make a great holiday gift. It's a nice creation. I hope to find one in the mall, it can make a perfect gift for Christmas.